Don’t talk these n****s, nah, now it’s time to show these n****s. Show these n****s like a movie, n***a! A$AP Rocky is right — it’s your turn now Twelvyy. A$AP Mob member Twelvyy is set to drop his debut album, 12, tomorrow, Aug. 4, and it’s looking to shake the rap game crazier than an LA earthquake. Tell me this trailer doesn’t give you chills. Yeah, it’s all coming back to you now, huh? 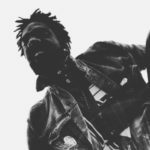 Besides pairing up with Rocky on “Trilla,” Twelvyy has also appeared on tracks with A$AP Nast, the Mob’s debut mixtape Lords Never Worry, Asher Roth’s Pabst & Jazz, several of Smoke DZA’s projects, and a couple of tracks with The Flatbush Zombies. If you never heard his music before (which is next to impossible because almost everyone fucks with the Mob) at least put some respect on his name for his clothing brand Last Year Being Broke(n). The four singles he’s released off 12 are straight heat – an audio trailer of what’s to come. “Strapped” had me buggin’, then he released “Yea Yea Yea (Maps),” connected with Rocky on “Diamonds” and dropped “Periodic Table.” All four tracks straight up hypnotized me and locked my auditory mind in a Harlem coliseum. There’s much more. Twelvyy dropped the tracklist on his Instagram proving that he is not playing games. The 14 track album will also include newly co-signed Smooky Margielaa, Pro Era’s Joey BadA$$, The Flatbush Zombies, Onyx member Fredro Starr, Telana, and of course members of A$AP Mob. If you’re not hyped you’re whack af. Peep the playlist we compiled below to refresh you on Twelvyy’s sound. You’ll find some new tracks as well as some throwbacks.